This is one of the most popular historical destinations around Alibag. Janjira covers the whole island that it was built upon. It looks like the Fort is standing on water. A boat will take you to the fort and the boatmen will then also act as your guides for the tour. The fort is historically very significant. History enthusiasts will have a good time here. Although the fort is abandoned and in ruins, there are enough monuments inside its compound to make you understand and imagine how life must have been here centuries back. It is like a walk through the past. Murud janjira boat price can be vary from INR 20-50 to INR 100-300. Bargain with the boatmen to strike a reasonable deal. Carry your own snacks and water bottles. The boats can be really crowded on weekends. Do not go swimming by yourself. Distance From Mumbai: Approx. 159 Kms via Banglore Highway. Distance From Pune: Approx. 181 Kms via Banglore Highway. Distance From Alibag: Approx. 54 Kms via Revdanda. Hire a taxi to Rajpuri. A boat Ride from there. 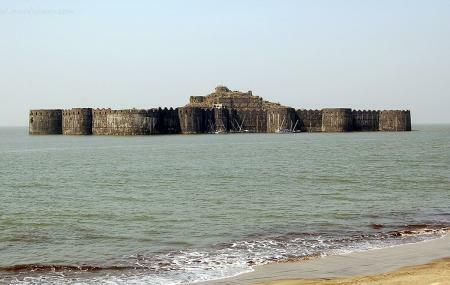 How popular is Murud Janjira Fort? People normally club together Korlai Fort and Vikram Vinayak Temple while planning their visit to Murud Janjira Fort.